While San Diego has many sushi restaurants, I have avoided writing about one up to this point; mainly it's just so you all won't discover how much of a sushi snob I am. On the other hand, this blog has been running for over six months now and I've probably given relatively few awards to places that have been reviewed. Kaito is well known in the local San Diego food scene has having the best sushi in San Diego. Yet, the restaurant itself tries to maintain the facade of being a hole-in-the-wall neighborhood joint; it doesn't even have an electric sign above the restaurant. The only way you would know the restaurant is there is if you knew where to look (between Santa Fe Cafe and Five Guys Burgers and behind Vitamin World). Kaito's sushi bar has 2 sushi chefs; Kazuo Morita and Joe (sorry don't know his last name). Chef Morita trained in Tokyo from an early age under two sushi masters. He does everything in his power to make sure you enjoy your meal and will often ask after serving you what you thought of the course. Instead of just saying "it's good" if you are able to describe what part you enjoyed, it will help him tailor the experience for you. Furthermore if you didn't like a part, saying what you didn't like will help him adjust as well. One common thing Chef Morita asks if you're sitting down for omakase the first time is what you don't like. Then, if things are going well and he has earned your trust, he will actually serve what you don't like. Oftentimes, the people who are served these dishes are surprised to find that they actually did enjoy Chef Morita's preparation. The other chef at Kaito is Chef Joe. Joe seems to be more of the joker of the two and he is often found cracking jokes with the customers. He also makes a famous stewed pork belly dish that I have yet to try. While I'm not familiar with Chef Joe's culinary pedigree, be assured that even if he is serving you, you are in for a treat as he asks the same questions as Chef Morita and makes the same adjustments. 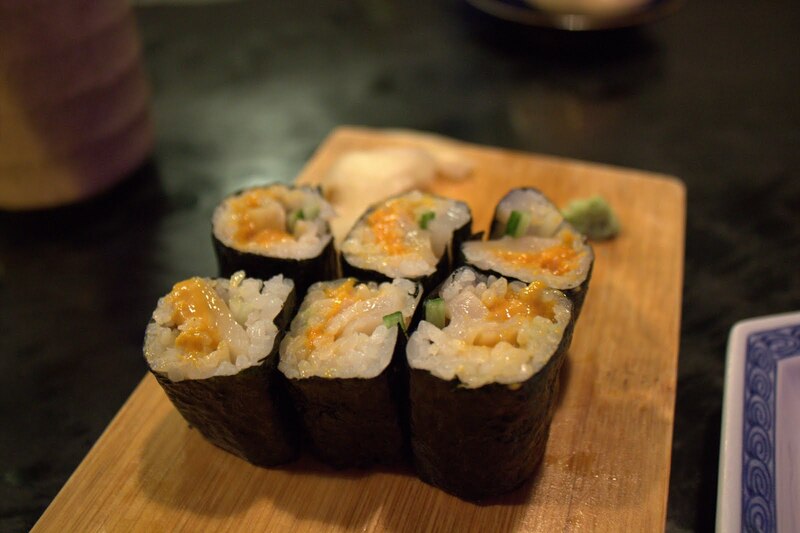 For example, Chef Joe found that it's better for him to apply both the wasabi and the soy sauce to my sushi before it's served while Chef Morita still serves the sushi with just the wasabi. A typical meal at Kaito for me starts with a few places of the specials (usually as sashimi). Being the late summer, the seasonal sushi is pretty much at the worst time of the year, so the selection was thin. I was served some Aji (Spanish Mackerel). This is usually a good way to start the meal since the ponzu dipping sauce that comes with the fish serves as a pseudo amuse. This aji was very fresh and had a good texture when chewed. It also contained the fishy flavors of mackerel that are desired without being too overpowering. Later, the Aji bones were deep fried to the point where it was basically a chip. While I'd like to say this was super special, it is merely something that can be done with pretty much any fish carcass so the bones are not wasted. I still really enjoyed the bones all the same. While I'm not aware of the intricacies, there is usually some progression to the sushi the way the courses are served. I'll merely present them in the same order. First up was the Maguro. Kaito only serves bluefin maguro and tuna can come from several different types. Furthermore while tuna is a year round fish, Chef Morita mentioned that we are just transitioning to where larger tuna can be caught. Apparently the larger tuna are older and have had more time for the oils to develop in the fish, which translates to better flavor. This maguro was no let down and a great way to start off the sushi courses. The Mirugai (giant clam) was very enjoyable as well. Generally shellfish have both a chewier texture and some additional natural sweetness that is not present in fish. The mirugai fulfilled both of those; further, I thought this particular mirugai was better than normal as it was sweeter than I expected. The amberjack was probably the best sushi of the night. It had a great depth of flavor and just the correct amount of oil to have the nice mouth feel. I savored every last morsel of this fish. The Kohada (gizzard shad) is a small sardine type fish that is imported from Tsukiji. It is available all year round and can typically be found at Kaito as well. When they are prepared, the fish filets have to be de-boned and you can see the chefs pick out the small bones. These are one of my favorite staples at Kaito has they have a tremendous depth of mackerel flavor, which gives a real character to the sushi. Furthermore, Chef Morita was explaining that there are actually five different types of kohada based on the size, and they have to order only this specific one because they believe it tastes the best. Note: It seems kohada is not offered to most first-timers unless you ask for it, so please remember to ask if you are interested. While I had known toro has different grades for the meat around the belly (chutoro, toro, otoro), I was not aware that there is actually toro around the collar (or kama). Chef Mortia explained that he doesn't like the toro from the belly as the fat dilutes the flavor of the finish too much, so he only serves kama toro which is even rarer than otoro. The toro was really good, but perhaps I've been jaded from my past Kaito experiences and didn't enjoy it as much as I should have. As far as toros go, it is definitely among the better toros I've had as there was a good balance of oil and concentrated tuna flavor. The oil made for a very nice and luxurious mouth feel as I was chewing. The other in season special was Ikura (salmon roe). Usually, the ikura is harvested only one time during the year and then it is salted and frozen to be served for the remainder of the year. However, some small portion of the harvest is not salted and not frozen, but is served immediately after harvesting. This ikura was among the unsalted one. While I've never thought of ikura as salty, it was definitely apparent when eating this that there was some salt missing. It was not as "fishy" flavored as the regular ikura since it lacked some of the salt, so it might be attractive to first-time eaters. However, as I'm used to the salted ikura and fishy flavor, I can't really say I prefer the unsalted version. As I was dining with Yao from Insert-Food, he let me in on a little secret. Usually at this time I would just get some uni (sea urchin) and be done with it in two bites. Instead, when Aoyagi (round clam) is in season, Chef Morita can make an uni and aoyagi roll. Since the Aoyagi is mostly flavorless except for the texture, and the uni has great flavor but lacks texture, this marriage works surprisingly well. The chewiness of the aoyagi carries the flavor of the uni for longer, which makes the entire experience much more enjoyable. While I didn't have the next dish during this particular visit, I thought to include it as it is a Kaito signature. The Anago (saltwater eel) is the only eel found at Kaito. When I asked why this was the case, Chef Morita explained that places that serve unagi only do it because the chefs are lazy. I keyed off his comment immediately and asked if it's because he had to nail the eel into the cutting board and filet it himself. He was very surprised that I knew of the procedure and showed me both the nail and the hole in his cutting board that is used for the process. When I later asked Chef Joe the same question, he mentioned that unagi is great for eating in donburi but only anago can be served as sushi. The anago preparation I get usually includes 1 as teriyaki flavored and the other as salt flavored. I prefer the salt flavored as it allows one to taste the flavor of the eel more. Compared to unagi, the anago is very delicate when cooked. It must be eaten with extreme care, but the texture difference is noticeable and much more enjoyable to me. Finally, because they filet the eels themselves, the eel spines are available to be ordered deep fried. This is a very fun experience for those that enjoy eating deep fried bones. 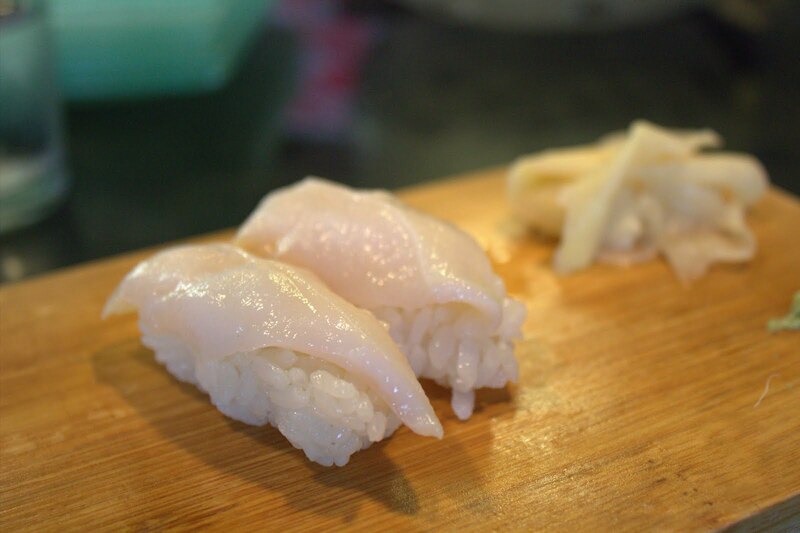 Overall, I consider Kaito to give the best sushi experience in San Diego. The fish is super fresh and there is a wide variety of high quality product imported from around the world. I will caution that it is best to go on Tuesdays or Fridays because the Tsukiji shipments come on those days, but Wednesday and Saturdays are okay as well. I would not recommend going on Thursdays or Sunday as part of the experience would probably be missing. Was the unsalted ikura sweet? I really love Kaito - ingredient expense/presentation aside, and just in terms of ingredient quality I wouldn't put it that far behind Urasawa. To me, I didn't get any extra sweetness because the flavor of the roe covers any of the sweetness. I would say the comparison of the unsalted to salted roe is similar to that of pale ale to IPA in hoppiness.